I have received so many emails and messages from so many of you this past week asking about my fitbit. I'm so sorry it took me this long to write about it. I've had my fitbit for over a week now and I have to tell you that I am thrilled with it. I haven't used it as much as possible this week because of going back to work and trying to stick with my new plan. I really only had enough time to wear my fitbit and try to learn all of it's benefits. The thing that deterred me from logging my food this week was that the fitbit's food logging system does not have a lot of the food that I eat. It made it really hard to accurately log my food so then I gave up on the logging. Honestly one of the coolest features of the fitbit is that it measures the amount of food you eat to the amount of calories that you burn. Now you can see why I was so disappointed. However, I did remember that I read on someones review that you can connect your Lose It account to your fitbit. What an awesome feature! Some of you may remember that I used to log my food into Lose It a few months ago. I really like Lose It and I always found it to have most of the foods that I eat. It is really great because they have an iPhone app. Today I finally had the time to google how to sync the two systems. It wasn't hard at all. I just had to log into Lose It and go into the settings and click on add new device. It was super simple. Now I 'm really ready to get started! I can't wait to share with you this week how well it works. I think the eat to burn ratio is really going to encourage me to stay on track throughout the day. It will make me want to move more and burn more calories. The fitbit has a lot of features. Counting the amount of calories I burn is of course my favorite feature but there are so many others. Every time you sync to your fitbit account it tells you how many steps you have taken, how many stairs you have climbed (very accurate), miles traveled, calories burned and it also gives you an active score based on how active you were that day. The fitbit site also has cute little graphs for each of the features I listed above. There is an activity graph that I really like. It shows you how active you have been throughout the day (Lightly active, fairly active, very active and sedentary) Each section of the graph tells you how many minutes you were in each area. It's very neat. You can also set up a food goal on the fitbit site. The goal you set depends on how much weight you want to lose in a week (1lb, 2lb etc...). Depending on how much weight you want to lose in a week it tells you how many calories you need to eat. This is where the Lose It feature comes in handy. You can track every calorie and have it all synced right to the site to make sure you are on track for the day. One of the coolest features of the fitbit is that it tracks your sleep. You push the sleep button when you crawl in bed and then it tracks your how long and how well you sleep at night. The next morning you wake up, turn off the sleep feature and sync your fitbit and it tells you how long it took you to fall asleep, how many times you woke up during the night and how many hours of total sleep you got that night. Another great feature of the fitbit is that it is so small. This is one of the major reasons that I purchased it. I didn't want something bulky on my arm while I am working in the office. I wouldn't mind wearing something like that to the gym but when I am working I don't want everyone to see that I am wearing it. 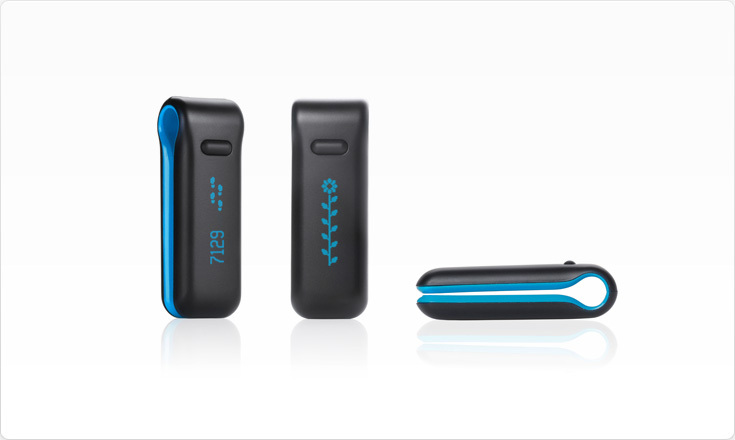 The fitbit can go in your pocket, on your belt or the waist of your pants or on your bra. I wear mine on my bra because I know that I won't lose it that way. It hooks right in the middle of your bra and no one can even notice that you are wearing it. At night I put it on the provided soft wrist band. Overall I am very happy with my fitbit. I think it is really going to help me want to move more. I enjoy looking at how active I have been throughout the day just by pushing a button on the device. When I am at work it makes me happy to see that I have walked a lot or it shows me that I need to move more. It's a great tool and now I can't wait to combine it with the Lose It site so that I can accurately track my calories eaten and calories burned. I would highly recommend this device to anyone looking for something to encourage them to be more active. I was not asked by fitbit to review their product. This review is my own opinion and in no way represents the fitbit company. That's aweful. I will have to be careful when summer comes. I did read about this happing to someone else when I was searching for reviews. They said that it died from sweat and the company replaced it for free. You should check with them.